After much anticipation on my part, the UPS man delivered my 1933 National El Trovador last nighti. 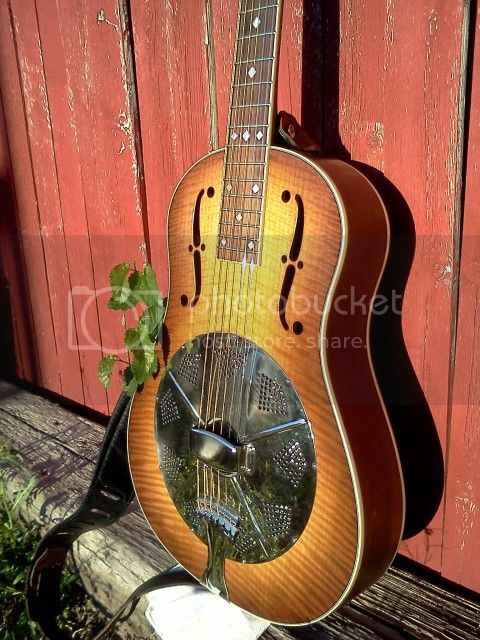 I had been on the hunt for a wooden body resonator for some time and jumped on this when it came available. Original cone, tuners and biscuit. Crisp tone, woodier than my metal body 2008 Vintage Steel Delphi. 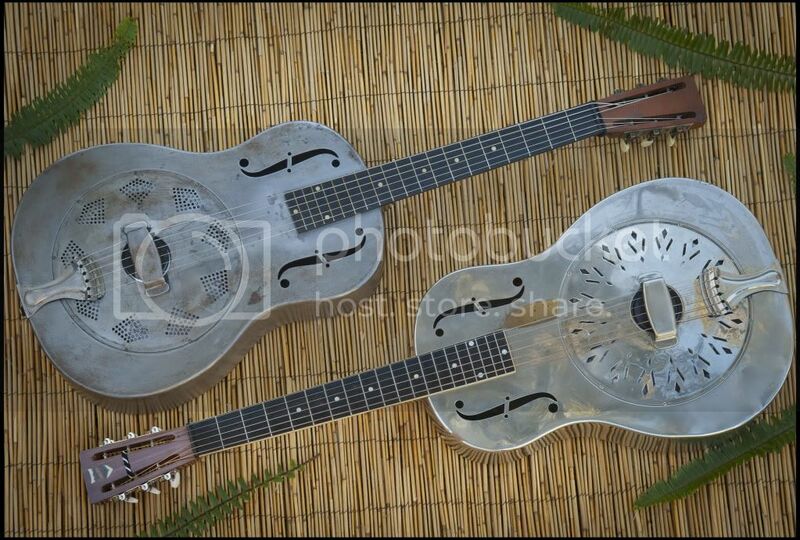 Action is almost TOO low which is nearly unheard of for these pre-truss-rod resonator guitars. I'm stuck at work now but all I can think about is getting my hands back on this instrument for more finger-picking fun. The delphi will be designated for slide and open tunings now. 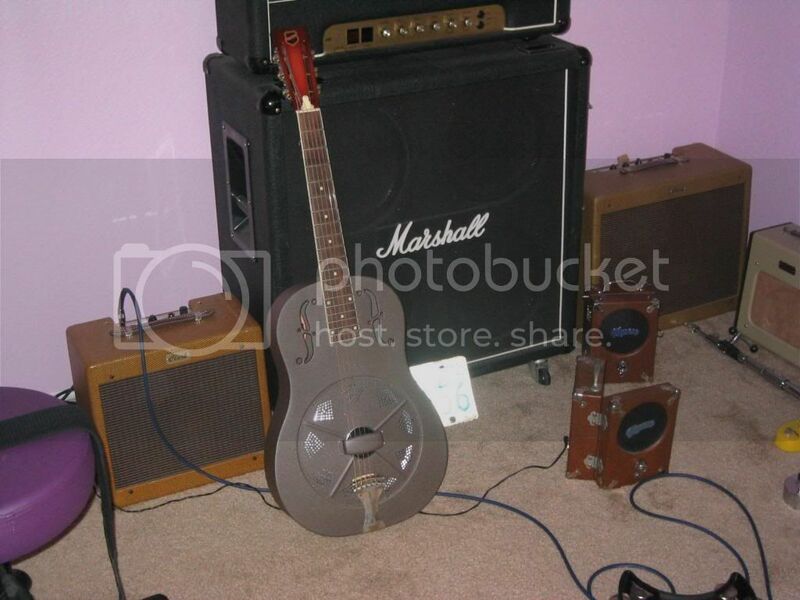 Pretty sweet 'thang right there and nice guitars all around. I'ma have to find my camera and post up a pic of my Delphi fer ya'. Wow, gomper! I wish I played guitar now. Oh man, that Radio Tone is just too cool. Give us a little background on her, Michael. USA made? Looks a bit art deco-ish, so what year? and what wood? Peace. wow, that radio tone is stylin'. Not sure I've ever seen one of those before. Here's my 2007 National Delphi. 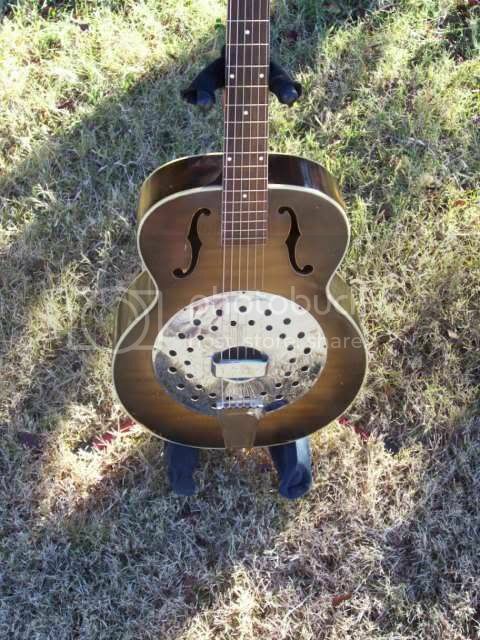 Not as purty as some of y'alls but its a stone blues machine. Always tuned to open G.
Shoutout to Leftyguitarman...I still have that Champ 600 as you can see. I'll try to answer a couple of the Radio Tone questions. If we have any NRP historians lurking about, I could probably use some authoritive corrections. 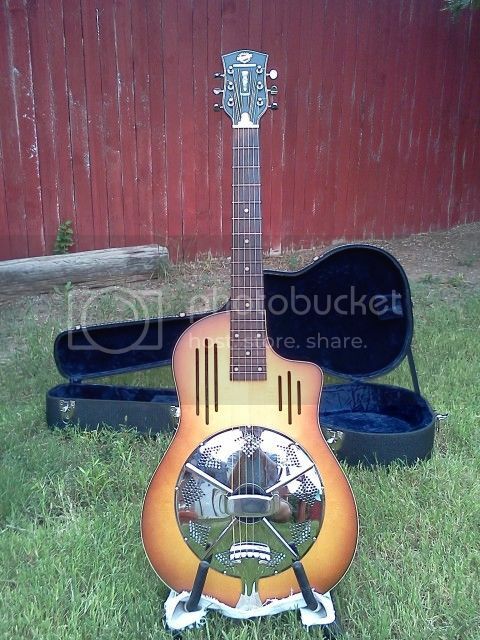 The name, of course, refers to the slotted sound holes that mimic an art deco styled radio speaker cabinet. I believe that the Radio Tones were made from about 1991 until 2006. Mine is a 2005 that I bought used. They were made with and without a cutway. 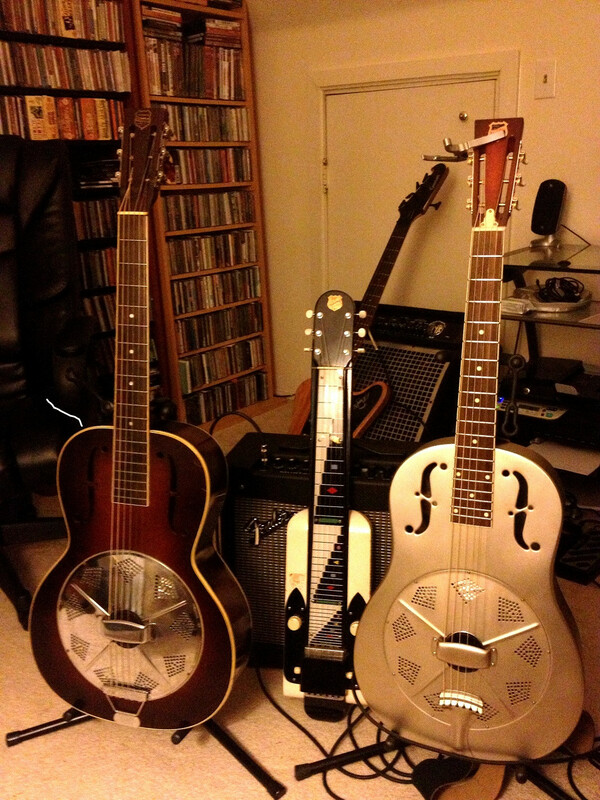 The ones with the cutaways are the Bendaway models. I've seen various spellings, with and without hyphens, the most elaborate being 'Radio-Tone Bend-A-Way'. I've heard that NRP is bringing them back, but I haven't seen any confirmation of that at the NRP website. Elderly, however, does have a new one listed, but no photos yet. I like a slotted headstock, too, but a solid one is not a deal breaker for me. In fact, I think that this one fits the overall look well. Of course, I have to say that, I just spent the bucks on it. I'm working on getting a sound clip together. I'll post back here if I can get it together in a reasonable amount of time. Oh yeah guys, they all look good! Amazing machine. I love the headstock it's right in keeping with the rest of the guitar. Real Art deco. Hey Gomper, that El'Trovador looks awesome!! I sure wouldn't mind owning one! How about recording a clip and upload it on YouTube so we can hear it in action?! bottleneckjohn wrote: Hey Gomper, that El'Trovador looks awesome!! I sure wouldn't mind owning one! I'll see what I can come up with, the sound of an 80-year-old cone is a unique sound indeed. I've already raved about the 'old wireless' appeal of the Radiotone, Michael, but the way you have framed that pic - right out of 'Paris, Texas'. Am I right or am I right? Now where is Mr Cooder? Peace. ps...and man am I lucky - I have a steel body Republic triolian and a wood body Republic triolian, so all the above pix of those beautiful machines hardly raise my GAS level at all. This thread inspired me to get the quiver together for a group photo.